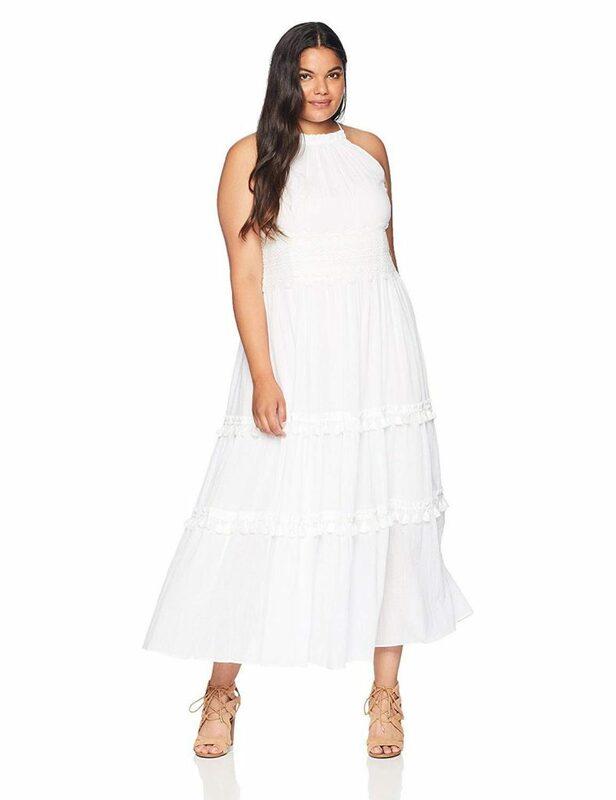 Looking for the perfect plus size summer dresses? Have you tried out Amazon Prime Fashion? Try before you buy with Amazon’s latest shopping service! Amazon is a magical website, where you can order just about anything and receive it (via Prime) two days later. 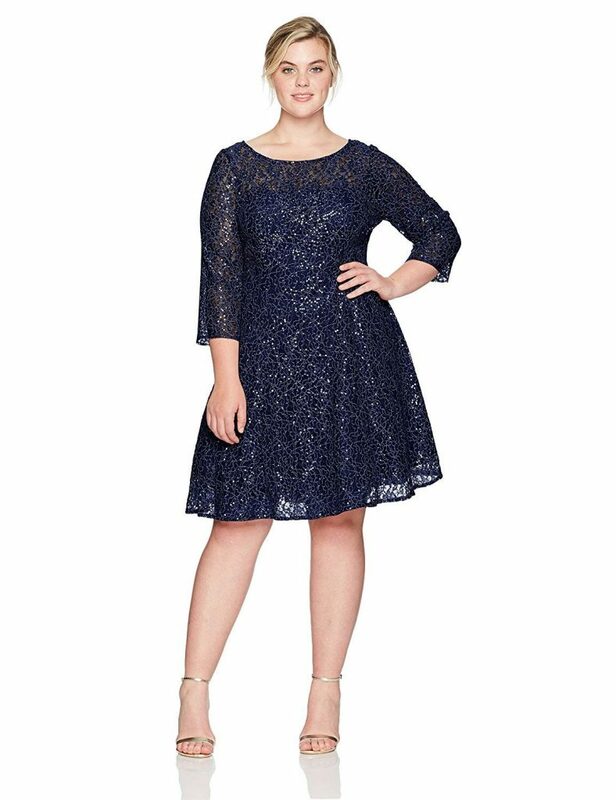 Before 2018, plus size fashion on Amazon was, not a thought at all… it was pretty hit or miss with shapes and patterns that were… pretty unfortunate, to me. However, this year, Amazon and Amazon Prime Fashion really stepped up its plus size fashion game! Have you been lately? Not just with the amazingness which is Prime Fashion, but also with their intimates! Did you catch our 40M plus size bra review from Amazon Prime Fashion? Well… do and thank us later! To share with you what we mean, we’ve gathered up some of our favorite plus size fashion finds on Amazon Prime Fashion. You know, Amazon’s newest program that lets you try before you buy?! We are kind of obsessed with this program and the new options for plus size fashion, including Amazon’s newest clothing brand, Lark & Ro! I know right? Yes, Amazon does have a new in-house clothing brand that goes up through a 5X in select items! But I digress, take a look at what we have found over at Amazon Prime Fashion! Plus minimalists, REJOICE! The Daily Ritual line from Amazon is perfect for babes who like to keep things simple, while reclining in an Eames chair reading Marie Kando. This Daily Ritual Women’s Plus Size Jersey Sleeveless Gathered Dress is breathable (perfect for summer) and comes in up to a 7X! Every woman needs a classic wrap dress and this Lark & Ro find is just what your curves and your closet has been looking for. Available up through a size 6X, this dress comes in array of colors that will work with whatever the situation calls for! Bow chika wow wow! This curve hugging mini dress comes in some #amaze jewel tones. This dress comes in up to a 3X but be sure to follow the brand’s size chart – not Amazon’s! OMG, POCKETS?! I love a dress with pockets, especially during the summer. Summer brunches are not ready for this fun fit and flare number. 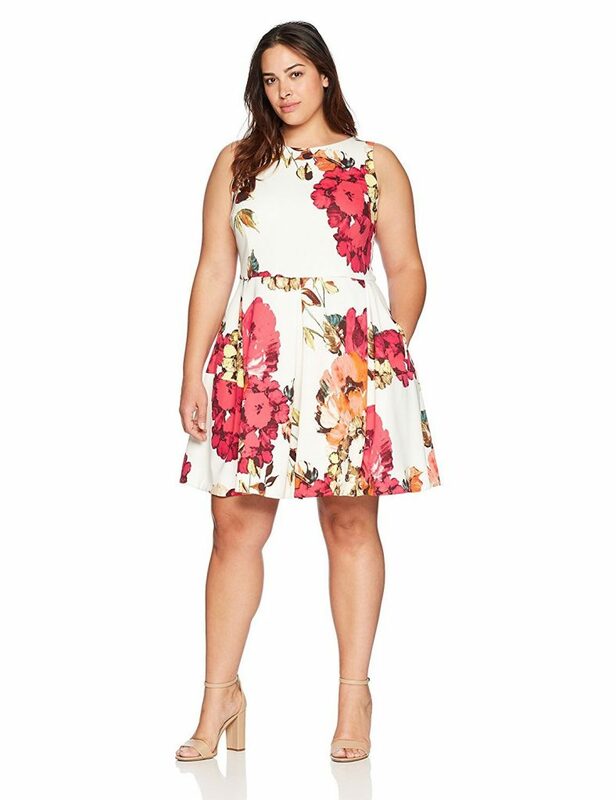 Perfectly placed florals with a great fit give this dress a must rock for the summer season. Looking for the perfect dress for a summer wedding, an evening cocktail function, or just a dress that will make you smile? We imagine that this dress will get its fair share of wear time and longevity in your closet! Available up through a size 22. For our bohemian flower child who is looking for something easy breezy, this dress has your name all over it. Perfect for the summer beaches, pool parties, or summer soirees, this dress is an option to play in up through a 3X. I am OBSESSED with this dress. 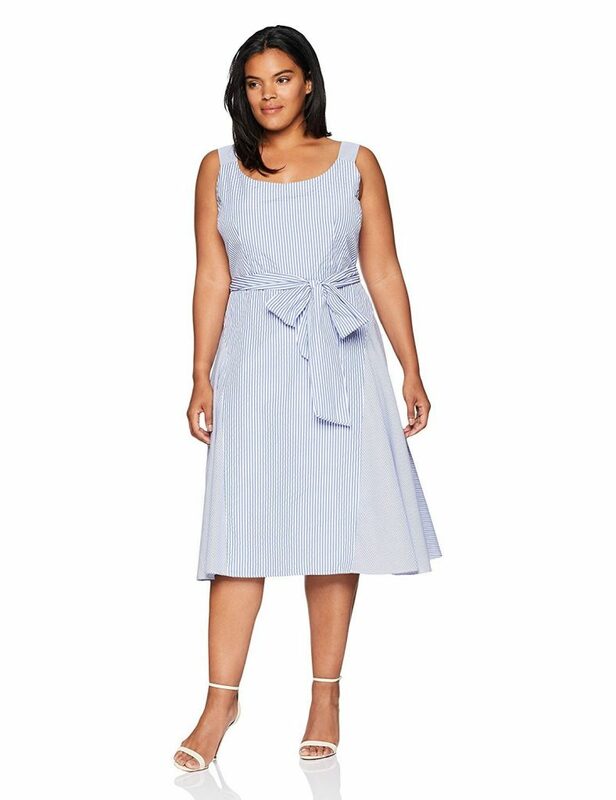 This dress is perfect for the office or a summer brunch and will likely hit mid-calf for shorter plus size shoppers. This dress is available up through a size 24. Finding dresses for an outdoor wedding can be tough. 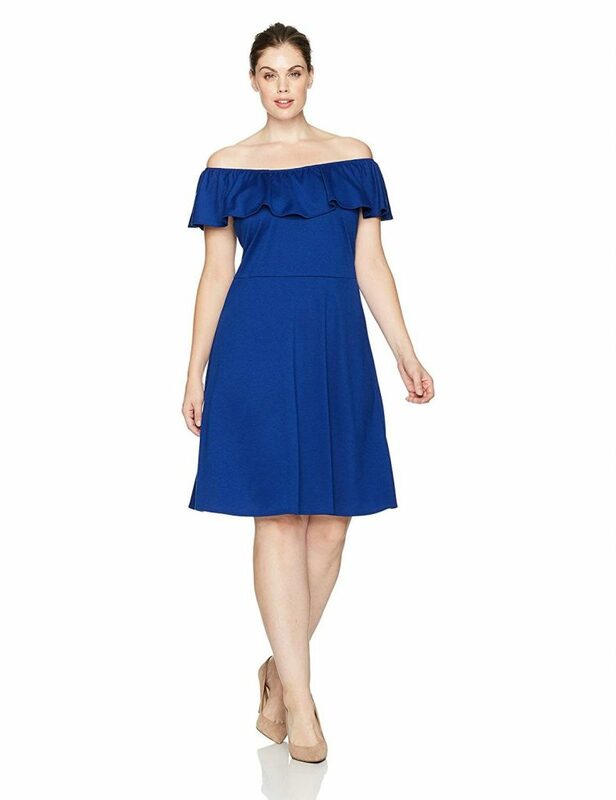 This off the shoulder dress comes in four striking options, with an ideal fit and flare silhouette and length for those more formal occasions. Ready for an all-white party? You can never have too many statement white dresses. This summer perfect maxi dress comes in white and a fun blue and white striped option and is available in up to a 26.
Who doesn’t love a fun polka dot? They’re wearable all year round! This fun print shows some of your fun personality, while still looking chic. This dress is available in up to a size 4X. The rouching on this wiggle dress is incredible! The peekaboo neckline hugs your assets, and the light fabric makes great for a cruise or other destinations with high temperatures. This dress comes in four colors in up to a 3X. Whew! This list had everything from beachy dresses to full on options for cocktail hour! Have you shopped Amazon Prime Fashion yet? We love the idea of trying before you buy and that this option is given to us for plus size fashion. With the limitations in where we can shop in person, having a service like this makes shopping a little less painful and risky, right? What are your favorite Amazon Prime Fashion dress finds? Share links in the comments!